Write...Edit...Publish (WEP) is ba..ba..back! Meet your hosts Denise and Yolanda! Been missing WEP? I hope so. I have been too. Luckily for all of us, YolandaRenée has been wanting to see WEP back again, as really, it is a unique online group where we can gather, share our writing in whatever form we choose, and get feedback if we want. Yolanda and I have been talking through lengthy emails, sorting through our ideas, and it seems we'll have a great partnership. Donna Hole, my previous co-host, is happy to help in any way she can, so I think sharing this load will result in a much smoother operation and should continue ad infinitum. WEP will not change overly at this stage, except the challenges will usually be every second month rather than every month, but we will be flexible depending on what else is happening in the blogosphere. That gives us all more time to do regular blog posts, or participate in other challenges. WEP will reboot with our first challenge on Wednesday, August 19, and then we'll have a spooky Halloween challenge for Wednesday, October 21. This will give everyone a chance to participate in other Halloween challenges, since October is so popular for flash fiction. November is all about NaNoWriMo for many of us, so we'll skip WEP that month, but then it's Wednesday December 15, with a post for the holidays. Don't worry. There will be a badge with challenges and dates created soon and will be published in a future post. In between, Yolanda and I have discussed posting blogs of an educational nature, such as Copyright and what it means, The Art of Critiques, Comments, Using Images etc. And to make the fun truly worthwhile, expertly-designed winning badges will be handed out for each challenge once again as we have done in the past. Yolanda and I will choose our top three, then an independent third party (the guest judge) will make the final choice. I know some of you have used the flash fiction you wrote to WEP challenges as part of larger stories, even novels, and have been missing this aspect of WEP. (My current WIP, a novel set in Paris, has certainly felt the benefit of rejigged WEP Paris stories I've written over the years.) Can't wait to get back to it! 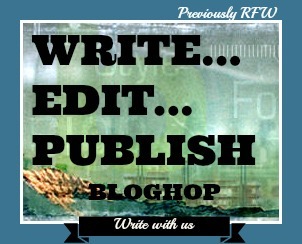 Sign up and spread the word – Write…Edit…Publish (WEP ) – is on its way back to the blogosphere. Facebook it, Twitter it, Instagram it...let's do a social media blitz! Yolanda and I are already talking about creating dedicated WEP social media accounts where we can communicate. Watch this space! Meanwhile if you tweet for us, use the hashtag #WEPFF.